Have you ever agreed to something without thinking about what it actually entailed? I’m a Yes Person. I say yes all. the. time. By nature, I love helping people, staying busy, being creative and feeling accomplishment. Sometimes I don’t think about what the steps are to actually get me to where I need to be—but I’ll usually say yes to a challenge regardless. I was recently asked to work with the MAKESHOP team to make quilts in collaboration with the Studio and Remembering Hiroshima, Imagining Peace project (RHIP). 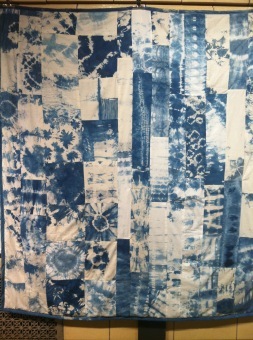 The Studio and RHIP had worked together to dye fabric in the style of shibori. MAKESHOP was given the beautiful squares and strips of dyed fabric with the goal of using the pieces to make four quilts. One quilt is a lot of work. Four quilts is, well, four times that amount of work. Along with being a Yes Person, I’d also consider myself a perfectionist and someone who loves elaborating on ideas. This can be a recipe for danger for someone working on a deadline. We talk about iteration a lot in MAKESHOP: doing things repeatedly gives a maker skill, confidence and the ability to share with and among their community. This was my chance. 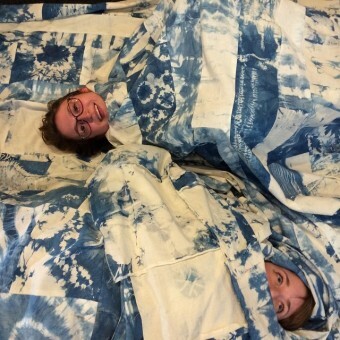 I’d only worked on one quilt prior to this project. My confidence was not high, my skills needed to be honed and I had a lot on my plate. I also had a hard deadline because these quilts would be hanging in our Youth Gallery space and would premiere at an opening. How did I approach this challenge? What were the tricks I used? I asked questions. I’d done this before. How was this quilting project similar and how was it different? 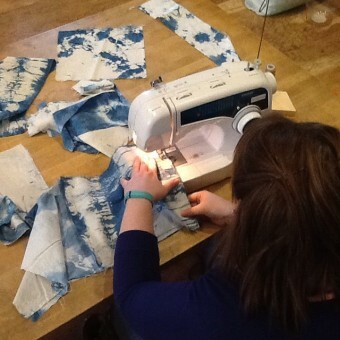 There were some serious advantages to using the shibori fabric: there was no “bad” side to the fabric. 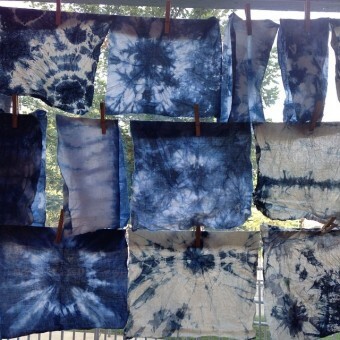 Both sides dyed differently, but the muslin was beautiful on both sides. I also opened up this conversation of troubleshooting with my coworkers. 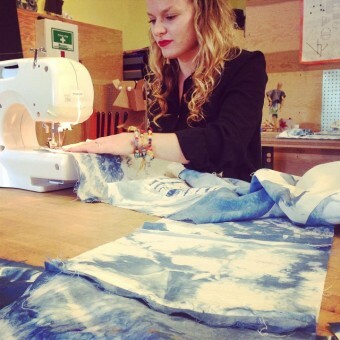 We shared resources, ideas and tips that we’d tried with previous sewing projects. I also consulted my favorite resource: the internet. Watching YouTube videos were invaluable. Sometimes having someone explain how to do something while they are sitting in front of me is so important to learning—even if it is through a screen. Eventually, I became comfortable. Working on 4 quilts at a time forced me to become more comfortable with the materials and techniques I was working with. I felt better about what I was doing and was able to streamline the process. I still wasn’t quilting perfectly, but I was able to talk about what I wanted to do and the quilts were going faster and looking better. Another amazing part of the process was teaching others. I quickly learned that if I shared the knowledge that I had, even small pieces at a time, I was able to teach others the process and skills as well. Soon, my coworkers and even our family members were zipping around on a sewing machine. Our confidence wasn’t always high—but it was definitely higher than when we began. One person would show another and eventually we all had a grasp on different parts of the process. We also tried new things—we saw what worked through experimentation. I felt charged up and ready to take on more sewing projects. I just needed to keep charging on. If I failed, I tore out the seams and began again. There wasn’t much time for doubt and hesitation. I failed—I’m sure we all failed working on different parts of the quilts—but learned how to adjust and make things work just a bit better. We really stuck with it and worked through the hard parts to finish our quilts, which are now on display in our Youth Gallery. I feel like we really persevered and found lots of learning opportunities. Two of our quilts will be gifted to museums in Japan, one will be with our collaborators RHIP and one will remain in Children’s Museum of Pittsburgh.